Burger King in the US is coming after McDonald's once again, this time by trying to steal the attention away from the 50th anniversary of its Big Mac. Last year McDonald's rolled out the Mac Coins to celebrate the anniversary, which customers could use to claim a free burger by the end of 2018. Now Burger King is taking over the promotion by letting people with expired Mac Coins to claim one of its own burgers. 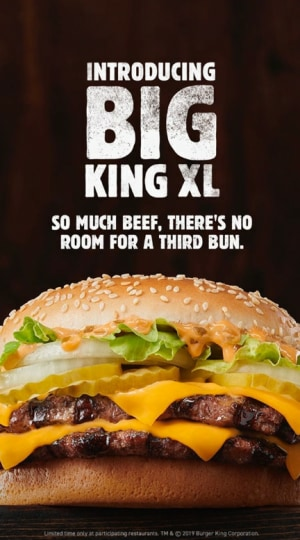 People with left over coins are able to receive a free Big King XL, a new burger that's strikingly similar to its rival's and claims to contain 175% more beef. It also takes a swipe at McDonald's in an ad declaring: 'so much beef there's no room for a third bun'. It's not the first time Burger King has leveraged its battle with McDonald's to sell its own products. In December 2018 it sent customers to its rival's stores to unlock a deal on the Burger King app for one-cent Whoppers. In fact, making reference to McDonald's has become a consistent part of Burger King's marketing strategy. The recent swipe from Burger King adds to McDonald's tough week. Yesterday it lost some trademark rights to the Big Mac name across the European Union in a case against an Irish restaurant Supermac's. The European Union Intellectual Property Office (EUIPO) said the multinational failed to prove genuine use of the trademark as a burger or restaurant name. Supermac's accused McDonald's of “trademark bullying”, saying it registered brand names and then stored them away to use against future competitors.